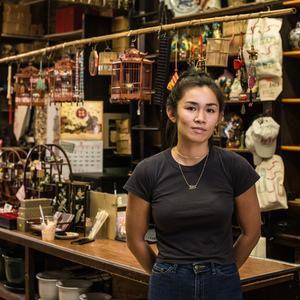 Mei Lum is the 5th gen. owner of her family’s 93-year-old porcelainware business and the oldest operating store in NYC's Chinatown, Wing on Wo & Co. (W.O.W.). In May 2016, Mei decided to take on the role of running W.O.W. to continue her family’s 5 generation-long legacy in the neighborhood and help protect the heart of Chinatown from encroaching gentrifying forces. Mei has also been working to amplify community voices and stories through her work with community inititative, the W.O.W. Project. Become a donor today! and help the W.O.W. Project reach our goal of 15K in celebration of W.O.W. 's 2 year Anniversary!